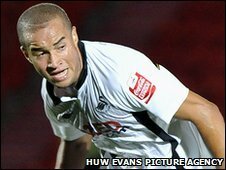 Swansea City defender or midfielder Ashley Richards has signed a new two-year deal with the Championship club. The 19-year-old made 15 league appearances last season, including 10 starts, and was voted young player of the year at the Liberty Stadium. "It was a steep learning curve at times, especially playing at full-back, but I thoroughly enjoyed it," said the Wales Under-21 cap, known as Jazz. "I'm a Swansea boy and I'm proud to finally agree the new contract." The club has also offered new deals to Fede Bessone, Albert Serran, Andrea Orlandi, Jamie Grimes, Shaun MacDonald and Leon Britton. Tom Butler, Cedric van der Gun and Angel Rangel have automatically triggered new contracts.